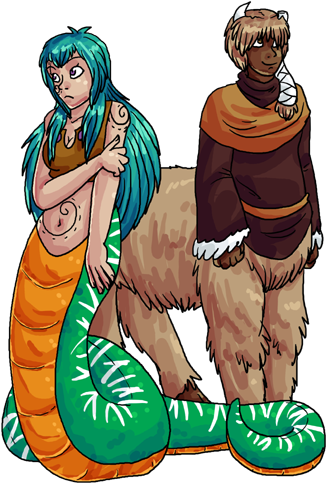 'Taurs are a very mixed group - a 'taur is basically anything with a human upper half and an animal (or monster) lower half. As well as this, some 'taurs have other small animal/monster physical attributes, such as antlers or animalesque ears. Half-'taurs tend to be quite similar to full 'taurs, but usually have fewer legs. They look more like satyrs than centaurs. 'Taurs are a very social species and they are known to get along with the other peoples quite well. Culturally, they place no distinction on the differences between peoples, and as such are often just as much at home with a group of any other peoples as they are with their own kind. The patron god of the 'taurs is Clyde, the God of Change. The average lifespan of a 'taur is 75-100 years. It is said that 'taurs were not one of the original races created by the goddess Gaea, a statement that is backed up by the various lower gods. The story goes that Jake, the Trickster God, though it'd be a great idea to play a trick on Clyde, the God of Change, and possibly to steal some of his powers too. Of course, as often happens, Jake's trick did not go quite as planned (though when asked he would say it had) and he and Clyde ending up magically transforming a large number of humans into the species now known as 'taurs. During this, Clyde was transformed into a 'taur as well and Jake managed to get away with some of Clyde's power. Nothin' much else to add, I guess.